BOOM!!! Behold the birth of a new web era…. This is just a place holder for the time being, but brownbot is going to be the launchpad for my indie games enterprise! Rhys Quest 1 is all set for a Christmas release. I have plenty of ideas brewing for projects to follow that. 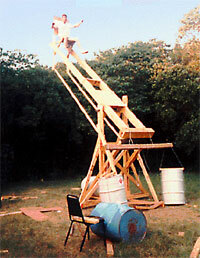 After a discussion with Upo over a few beers on Saturday night about building a catapult I did a Google search on trebuchets (a type of catapult)and stumbled across www.trebuchet.com run by Ron L. Toms. Yes this mad man built a trebuchet and shot himself into a river. It looks like alot of fun, Upo and I were talking about making a larger one and have no intention of riding it ourselves! He also runs a few other websites like the “Backyard artilary page” featuring the “Amazing catapult watch” and the “The only fully automatic machine gun that’s LEGAL in all 50 states!”. This is scary on many levels… last night I had a nightmare that I’d melted my iBook near a fire. I don’t know why it was sitting near a fire, or why I was there. Man I was pissed of, distrought would be the word, weird thing is it wasn’t till this morning when I grabbed it to go to work that I realised it was all a dream and a great sense of relief came over me. I think I’m getting a little too attached to my lappy, but You can hardly blame me!